And when you add some sea salt to balance out the sweetness, it’s perfection. This five-ingredient Dark Chocolate Sea Salt smoothie is an ideal way to savor that salty-sweet combination and treat your body to the superfood nutrition in Shakeology. This Dark Chocolate Sea Salt smoothie is an ideal way to savor a salty-sweet combo and treat your body to the superfood nutrition in Shakeology. 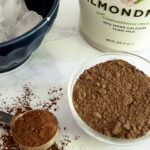 Place almond milk, ice, Shakeology, cocoa powder, and salt in blender; cover. Blend until smooth. A protein as part of breakfast.